The Gaikwad-Patil Group of Institutions (GPGI) is an education society founded by academicians with a sole view to promote professional education in the rapidly developing region of Vidarbha. Almost all the founders of the college are, or have been, academicians themselves. This gives them an edge over others in that they are in close touch with the expectations and aspirations of the young generation today. They are keenly aware of the changes traditional education has to undergo if today’s generation is to survive the ruthless competition the world has to offer. They are also the right people to foresee the coming trends in education. With Nagpur becoming the chosen destination in Maharashtra among just a few other hand-picked Indian cities for the Jawaharlal Nehru National Urban Renewal Mission, the city is quite the happening place – both economically as well as socially. The MIHAN project in Nagpur is just one proof of the vibrant future the city has. The GPGI, with its unique academic background, was quick to realize the potential that Nagpur held. In the near future, the GPGI is poised to become one of the best and most dynamic institutions which will cater to varied educational needs of the increasingly bustling region of Vidarbha. ♦ Tech Mahindra Pool Campus Drive For 2018 & 2019 Batch. Procedure for obtaining Degree &TC. Student verification charges for Degree / Marksheet / Tenure/ Branch / Grade etc. 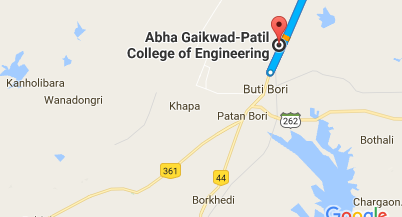 ABHA Gaikwad-Patil College of Engineering. Mohagaon, Wardha Road, Nagpur, 441108 Maharashtra, INDIA.